This collectible design console table belongs to the Utopia collection series designed by DRAMA Studio. Limited edition of 8 units + 1 A.P. The piece in its current version consists of the following finishes: wood (structure), copper leaf, white lacquered, stainless steel and velvet ‘Deep Baltic’ (inside drawers). Customizable upon request. Item is made to order. “Certificate of Authenticity” included and signed by the artist. Measures: W 180 x D 47 x H 90 cm / W 71" x D 19" x H 35" in The Utopia console table with 3 drawers enhances the beauty of unbalanced balance. The 60 elements are coordinated in an elegant dance of shades and irregular shapes that embraces the soul. A high-end piece that transcends the duality of the universe, where white emphasizes the pursuit of creation. DRAMA unifies the most daring voices and spirits who pursuit singularity. A different way to place art in the world, where design doesn’t praise functionality, but venerates irreverence. DRAMA presents itself as a parallel universe in which there is an utopian freedom to create and materialize abstract representations of what is presented as surreal. A vision that embraces irregularity, uncertainty and unbalance, where design has no fear, limits or rules. Imagine a blank canvas in which you can put all the magic that flows in your dreams. An unique experience that will make you fall in love with each element of an exclusive puzzle. DRAMA’s concept is inspired by the beauty of utopia. It refuses the ordinary, defies visionaries, feeds the imagination and has the power to hypnotize and transport us to another dimension. 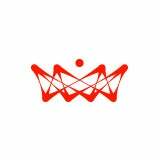 Its entire manufacturing process is based on detail, talent, expertise, high-end materials and quality finishes. Each piece in the collection is limited edition and their customization allows the designer to connect with the client and together create a meaningful piece, with a bold personality. Surrender yourself to DRAMA´s passionate attitude and turn your dreams tangible. A Memphis style console table from the late 1980s that's been updated with lacquer. Angular cantilevered white lacquered wood console with glass top. 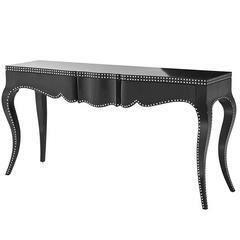 Console table Talia in black lacquered mahogany wood with nickel nails.